Chargpump safety circuit. In line with E-Stop loop. Isolated F/V converter for spindle VFD. Auxillary relays for coolant or whatever. In the left section of this photo you can see the main power supply with it's transformer, rectifier and capacitor. 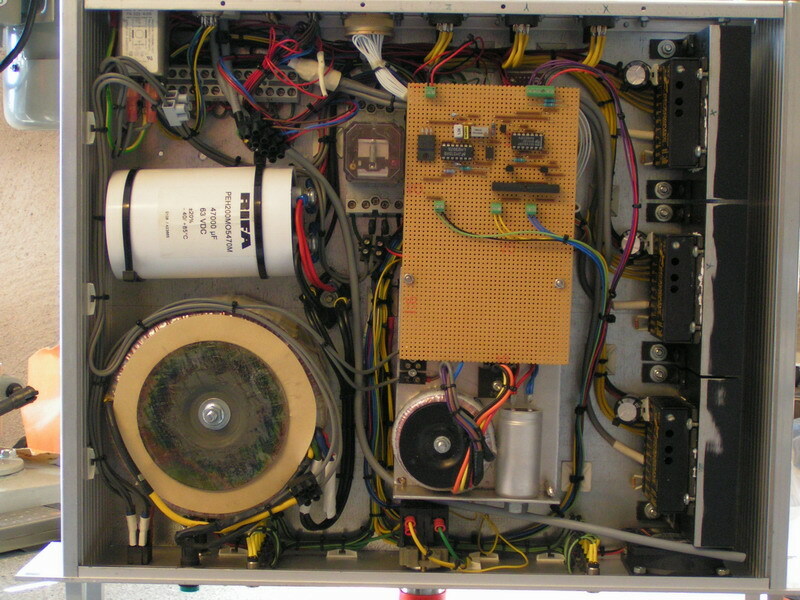 The middle section shows the V/F converter for the VFD and the auxillary power supply The cards for the opto isolation, chargepump safety circuit and auxillary relays are hidden below the auxillary powersupply. The right section of the box contains the three stepmotor drives mounted on heatsinks. The relay between the capacitor and the circuit board is the main power supply contactor. This turns off the 220V AC to the main transformer whenever there's an E-Stop condition. I'm not too satisfied with the look of the inside of this thing but it wasn't supposed to be this much stuff in it from the beginning. There is a little space left on the vero board for the V/F converter but other than that the box is pretty much full to the limit. Here's a shot of the back of the box. Starting from the left we have the motor outputs and it's corresponding fuse. Then there's the connector for the external I/O (homeswitches and such) this connects to a box on the back of the machine where the cables for the homeswitches etc are connected. Below it there's the DB15 connector which is used to supply 5V from the computer to the G210's. To the right we have the two parallell port connectors which of only one is used at the moment. Then there's the connector for the VFD, carrying On/Off- direction- and frequency signals. There's also two extra connectors for the E-stop loop (the gray cables). One is for the E-stop button on the control panel and the other one is not yet implemented.. To the far right we have the power inlet/filter and it's fuse.